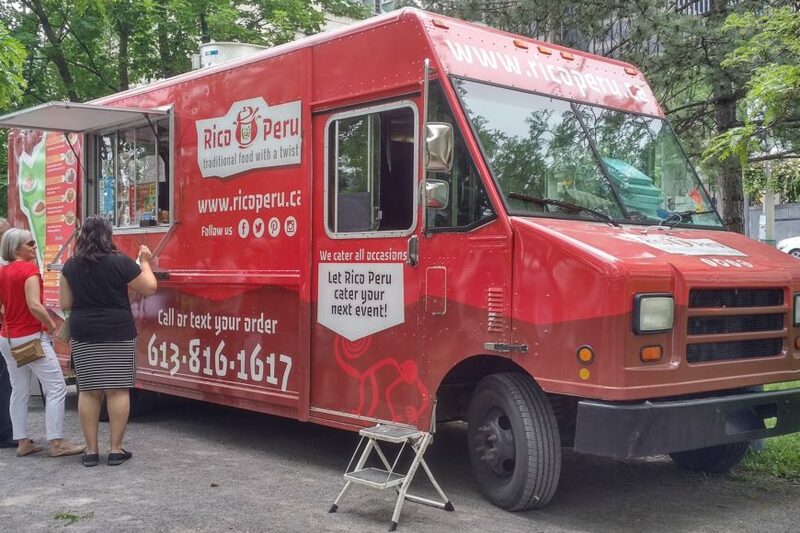 Over the past two food truck seasons, I was able to hit up Peruvian food truck Rico Peru on a couple occasions – once at a small food truck rally, and a second time at their regular spot downtown. On a lazy summer day last year, I saw on the Street Food App that there was a small rally of food trucks happening between the Library and Archives building and the Supreme Court. I had a nice bike ride downtown – and worked up a good little appetite in the process. When I had tried some things at Rico Peru before, they had been sold out of their empanadas. Having arrived early on for the rally, I had to give the empanadas ($4.80) a go, ordering one and tagging on a Peruvian pork roll ($5.50) as well*. After getting my order, I found myself a grassy patch – away from the growing horde of civil servants – on which to enjoy my food. The pork roll was a bit on the small side, but had a great flavour to it. 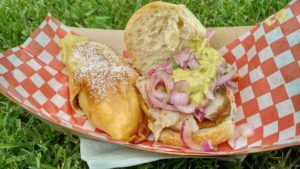 The thick slice of pork belly was tender and juicy, and the onion slaw brightened up the sandwich with a tangy punch of citrus. Fried slices of sweet potato added the sweet and earthy taste of the orange tuber, and the lightly crusty bun held up well without being too chewy. The empanada was larger than what you’d typically get in a restaurant, being more equivalent in size to a Jamaican beef patty or British hand pie. The crust was thin, but supple enough to hold everything together. The ground beef was tender and moist, not at all rubbery or overcooked, and had an earthy seasoning with just a hint of spice. Some green olives and boiled egg inside the empanada added further diversity of flavour. It wasn’t the best empanada I’ve ever had, but well worth trying. 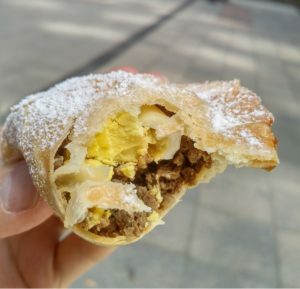 The empanada I got on a second visit at the start of this year’s food truck season was consistent with this previous one. 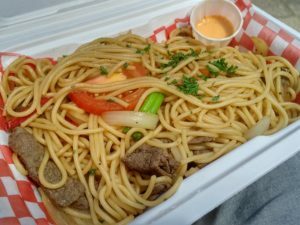 On my most recent visit, I also tried their tallarin saltado ($12.20) a dish of beef, onion, tomato, green onion and bell peppers stir fried with noodles. The container was hefty; between the weight of this dish, plus the empanada I had ordered, I knew I’d be taking some noodles home. It wasn’t a revelatory stir fry, but it was a solid meal. A bit brighter than a typical Chinese stir fry with the fresh tomato and lower dose of soy sauce – I enjoyed its composition. The noodles were comparable in diameter to spaghetti, and were sauced just right. The strips of beef were tender and moist, and adequately plentiful. Hot sauce provided on the side added a slightly fruity flavour, and powerful hit of heat. A mango and pineapple slushy ($3.80) was tasty and refreshing, but a bit on the small side (~8oz) for that price point. The younger of the father and son team was working the window when I was there this spring, and was super friendly and helpful. While some of the more on-the-go menu items are a bit pricier for the amount of food that you get, the mains are spot on in quality and bang-for-your-buck. Rico Peru is a place you should check out to expand both your culinary horizons and your waistline. * The pork roll was not on their menu on my most recent visit.